Following Saturday’s demonstration lap of the Yas Marina circuit in Abu Dhabi, Sunday’s stage marked the first of five timed specials in the dunes to the south of the city. With no prologue to determine the start order, riders set off according to their final results from the 2017 world championship. Matthias Walkner was third away followed by Sam Sunderland in fifth and Toby Price a little further back, setting off 14th of the 26 riders. With a total of 418.38 km covered on Sunday’s stage, 276.01 km were timed special. 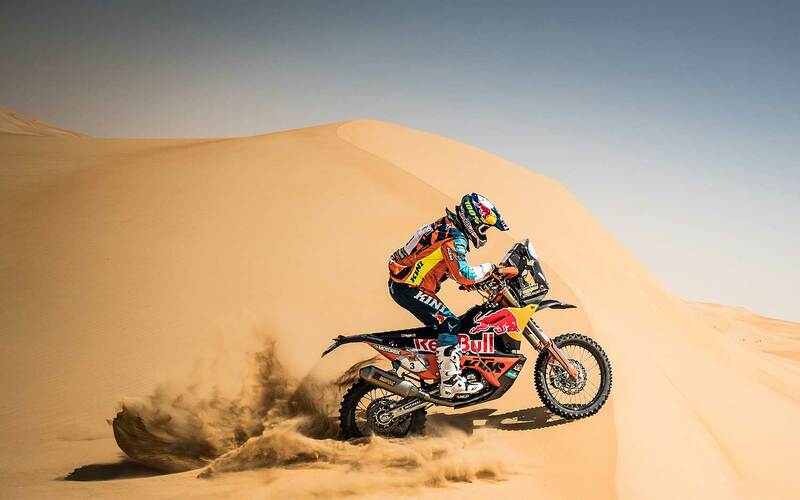 The first half of the stage proved to be faster and harder on tyres than anticipated and the three KTM riders were forced to swap wheels at the refuelling stop. The following half of the stage was made up of the soft sand characteristic of the area and the trio were able to push much harder and ultimately claim the top three positions on the day. 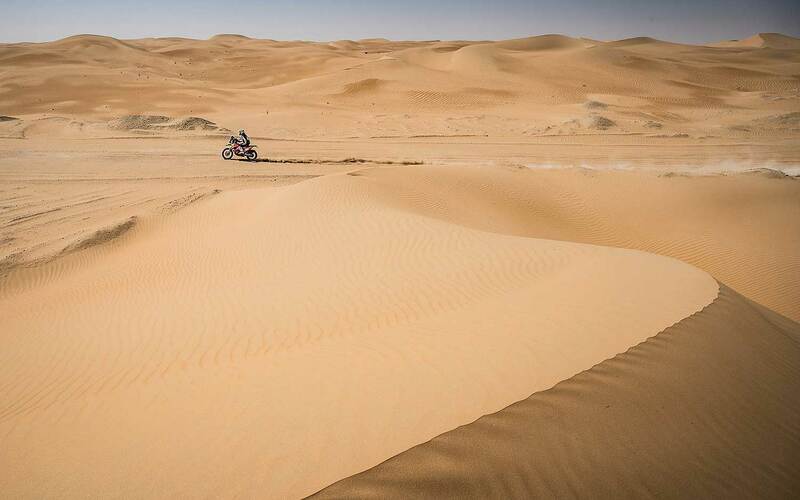 Toby Price: " It was just sand and then more sand"
Not having tested with the rest of the team in Morocco, the Abu Dhabi Desert Challenge marks the first time back on a KTM 450 RALLY since the Dakar for Toby Price. Starting further down the field, the Australian was able to maximise the advantage and eventually crossed the finish with a time close to three-minutes ahead of team-mate Sunderland. "The day was really good today," said Price. "We had a little issue with the fast hard-packed piste at the beginning of the stage, the tyres got really warm and we had to change them at the fuel stop. After that it was just sand and then more sand. The bike performed perfectly, the team have done an excellent job preparing it for me, it’s handling beautifully in the dunes. I’m feeling comfortable even though it’s my first time back on a rally bike since Dakar. I’m looking forward to tomorrow now and seeing what the rest of the rally will bring." A small mistake navigating around a herd of camels on the second half of the timed special may have cost Qatar resident Sam Sunderland a little time. 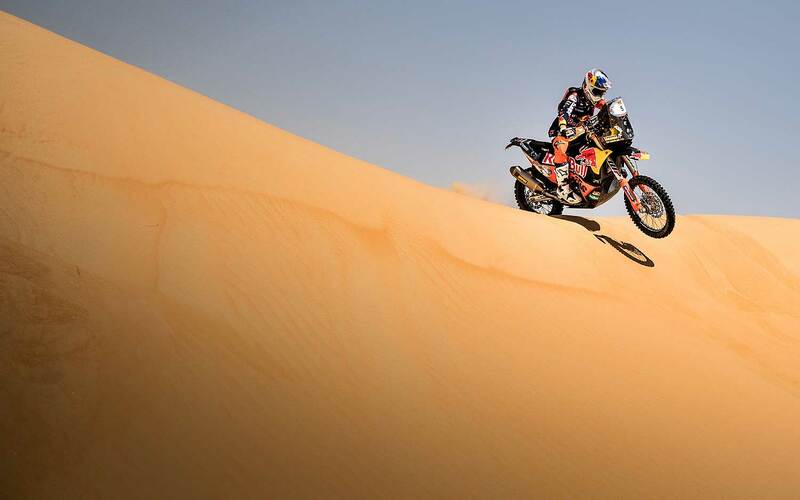 But his pace in the dunes is always impressive and the Brit went on to claim a strong runner-up position. Sam Sunderland: "A lot of camels that were right on the piste"
"Today went ok, I am happy with second, just a couple of minutes down on Toby," reported Sam Sunderland. "I did make a mistake this morning with the tyre choice and lost some time at the refuel to change the wheel. I then pushed hard on the second part of the stage but at one point came across a lot of camels that were right on the piste. I went around them, but then lost more time trying to get back on track. We still have another four stages to ride so I’m looking forward to that." 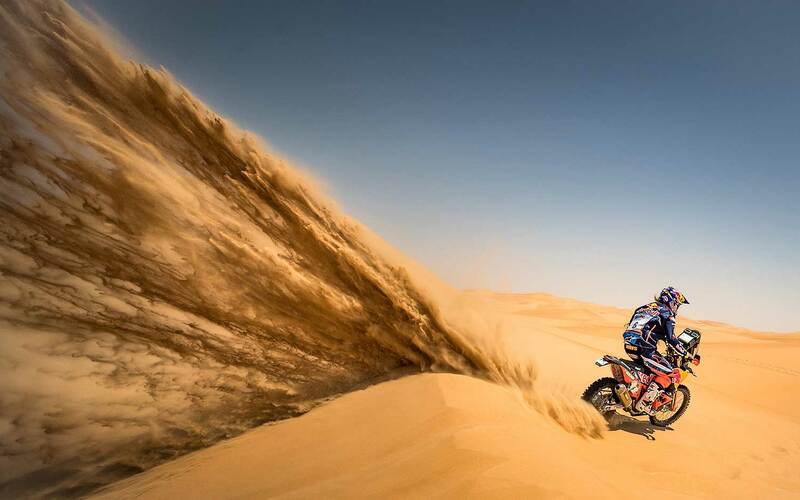 2018 Dakar Rally winner Matthias Walkner was third away at the beginning of the stage. With only two riders ahead of him to chase down, the Austrian kept to a fast but steady pace doing enough to finish the day third overall and putting him in a good position for Monday’s timed special. "Today went well for me, especially as I was a little worried that I hadn’t had enough on-bike time since the Dakar," said Matthias Walkner. "I also hurt my shoulder a little in testing and so didn’t want to risk too much on this first stage. To finish third after setting off near the front is better than I expected and puts me in an ok start position for tomorrow, chasing down Toby and Sam. The rally is quite a tough one as 90% of it is ridden in the sand, so I’ll keep on riding consistently and see where I am at the finish."